"Some of our music critics look askance at the Russian Ballet, and apparently, only deign to notice it at all because the music employed is such as falls within their province to review. Having the task forced upon them, they relieve their feelings by deploring the forced association of, for example, Schumann and patterning feet..."
A one page review by Edward Louis Bernays (1891 � 1995) writing under the nom du flak "Ayhern Edwards" in order to remove all suspicion that he was in reality the P.R. man who had been hired by Serge De Diaghilev (1872 � 1929) to smooth the way for his troupe as they toured the fruited plain throughout 1915. Strangely, he had nothing terribly critical to point out. 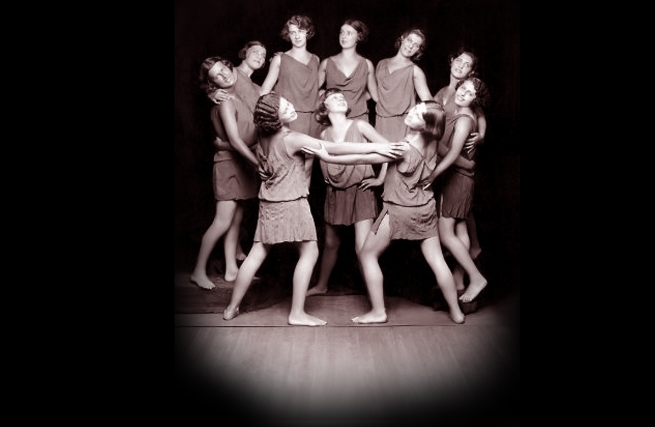 Three photos and a few well-chosen words concerning Ruth St. Denis' dance school in the wilds of California.